The knight helmet is popular for school projects, knight costumes for Halloween, or with our directors for use on stage. Don’t forget to check out the rest of our knight costumes and accessories to create your own knight costume. 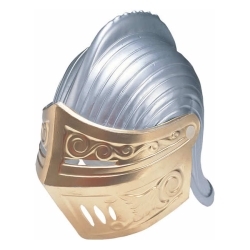 The knights helmet is made of a rigid plastic with a moveable face guard, and will fit a head measurement of up to 23.5”.